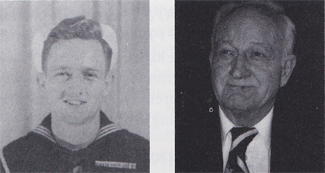 William Roseboom, Gunner's Mate, born in New York City and enlisted in the USNR June 2, 1943. He arrived at Great Lakes NTC on his 17th birthday, June 3, 1943. After training, he was shipped to the West Coast and assigned to the USS West Virginia (BB-48) which was in repair at the Bremerton, WA, Naval Shipyard after being sunk at Pearl Harbor. Assigned to the 11th Div. 20mm gun batteries, then sent to Gunnery School. He served on the bow in Group #1, Gun #1. He fought in the battles of Leyte Gulf, Surigao Strait, Luzon, Iwo Jima, Okinawa and was at the occupation of Japan, Sept. 2, 1945. Although not aware of how important and well-known the event would become, one of his most memorable war experiences was seeing the raising of the American flag on Mount Suribachi, Iwo Jima, through his observation binoculars while on duty in the gun tub. Another one of his many experiences not to be forgotten was at the battle of Okinawa. A kamikaze came in low on the water over the battleship's destroyer right up the bow, straight for the Wee Vee. The captain ordered that only the three guns on the bow could fire so as not to sink the ship's own destroyer. The Japanese plane was hit in the canopy and the Japanese pilot slumped half out of the cockpit. The skipper swung the Wee Vee hard to starboard just as the Japanese plane exploded into the sea off the port bow. After the war, Roseboom served aboard the USS Kyne (DE-744). He retired as GM SN from active duty in 1950. His awards and decorations include the American Theater of War, Asiatic Theater w/4 stars, Philippine Liberation Medal w/2 Stars, Philippine Unit Citation, WWII Victory Medal, Navy Occupation Medal and Good Conduct Medal. He worked for many years for Castro Convertible Corp., retiring in 1972 as a purchasing agent, after a severe injury caused early retirement. Roseboom and his wife, Maria, have one son, three daughters, five grandsons and three granddaughters. They enjoy traveling.